After the success of our previous Morris Traveller events we've decided to do it again. 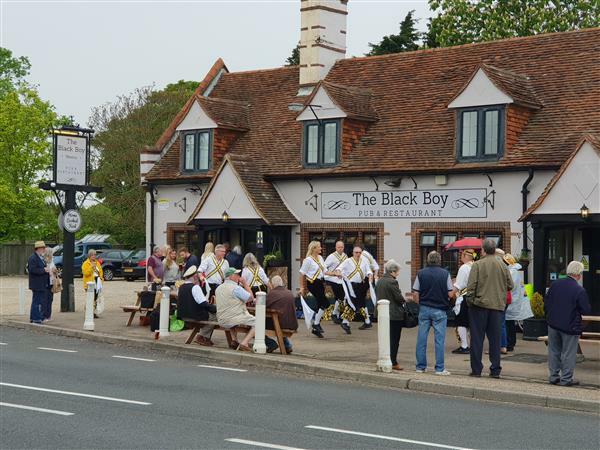 Take one side of Morris dancers, add one coach, top up with CAMRA members and plot a route from pub to pub with a dance at each, et voilà - Morris Traveller. The 2012 event featured a few showers and indoor dances, with many of the audience wondering how the dancers weren't banging their heads on the low beams at one of the stops. This did at least show that rain doesn't stop play! Since then the weather has been generally favourable, but whatever the weather the trips were enjoyed by all. This year we are again grateful to "Leading Lights Morris" for their participation. Please note: All timings are approximate. Contact our social secretary to see if any seats remain on the coach, or to be added to the reserve list. Alternatively come along to one of the stops and join us for a pint and a dance. Some of the pubs on the Morris Traveller route are participating on our 2019 pub passport trail; if you don't have a passport already they should be available at each of the pubs. Have you got a noticeboard where you can help to promote this event? If so please download, print and display this A4 poster. Last year's page is available here.